This is reason No. 2 in the series. Please read my introduction and explanation here. I remember the last time I attended Mass as a Catholic. I didn’t get there early enough (yeah…I was probably late), and it was the last Mass of the day, so it was packed and I had to stand in the back. My boots had a heel a little too high for comfortable standing and before long all I could think about was my aching feet. As I stood there in pain I thought, this is ridiculous. The only reason I’m here is to avoid the guilt I would feel if I wasn’t. And in an uncharacteristic (but quite reasonable, really) act of rebellion, I walked out halfway through the service. And never looked back. Is this biblical? Well, one certainly gets the impression from reading the New Testament that a regular, even weekly coming together as a church body is recommended. At the Last Supper Jesus commanded us to break bread together to remember his sacrifice. That’s not something we can do as a solitary Christian. In Acts 20:7 Luke indicates that the disciples were in the habit of meeting together on the first day of the week. Also, in the book of Hebrews, we are told not to neglect this gathering with fellow believers. But legislating weekly attendance under threat of eternal punishment is simply unwarranted. Nowhere in Scripture are we commanded to attend church every Sunday. Even if you transfer the Sabbath day mandate to the church-age Lord’s Day, the commandment is to “keep it holy” and do no unnecessary work. Not to go to the Temple, or synagogue, or church. Not only does the Catholic Church order Sunday Mass attendance, but also requires it on specific “Holy Days of Obligation.” These include Christmas, All Saints Day, three feast days for Mary, and a few others. A Catholic misses Mass on these unbiblically solemn days at his or her own peril. But “once” and “often” are time descriptors that are in opposition to each other, and asserting both in reference to the same event is simply incoherent. All numbered references in parentheses are source paragraph numbers from the Catechism of the Catholic Church. faith really starts where reason ends. however i can agree with you for some of your arguments but i would say you are still worried about the rules and regulations and Christianity is not all about that rather it is about the person of Jesus Christ, find him love him, You will find meaning in his presence in the mass>>. Thanks for reading and commenting, Manu. I’m sure Catholics find meaning in the Mass, and I affirm that many, like members of my family, truly love Jesus. As do I. But that does nothing to counter my arguments about the doctrine and practice of it. 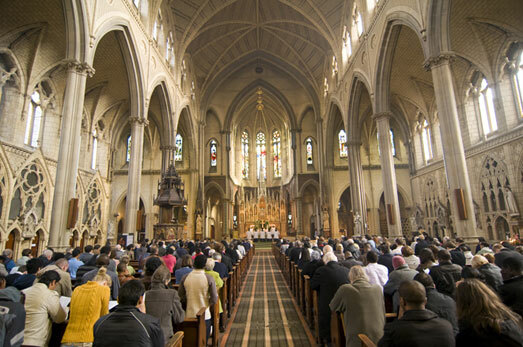 I grew up as nominal Catholic and I can understand your feeling that you went to Mass just to please your Catholic parents – because so did I. I did not understood what was going on – it was just ritual any Catholic should do on Sundays. My parents sent me to Catholic schools, from kindergarten to grade 12. Despite of this I knew very little of my faith. Later in my life I became evangelical, mainly from the influence of evangelical friends of mine and lack of knowledge of Catholicism. I spent a few years as evangelical and then returned to the Catholic Church. I started studying and continue discovering the truth and the beauty that many evangelicals fail to see. You have problem with sacrifice of the Mass and it is classical problem – The Mass, according to you, is re-sacrificing Christ again and again, contrary to what the Bible says “once for all” and “it is finished”. When did Christ offer Himself as sacrifice, once for all? Obviously you would answer: on the cross, almost two thousand years ago. It is correct answer but Scripture goes deeper than that. From Rev 13:8 we know that Christ as Lamb of God has been slain from the foundation (the beginning) of the world. The Greek verb “to slay” is in passive perfect tense. Unlike English perfect tense, Greek perfect tense indicates continuity of completed action. Suppose I write the following sentence in Greek: the door has been closed since last week – it implies the action (i.e. to close the door) was completed last week and the door remains closed ever since. If somebody opened the door later, i.e. the door is now open, then I cannot use passive perfect tense – it should be in imperfect tense or plu-perfect tense. There are many passive perfect tenses in New Testament. The last word of Christ according to John Gospel, that you quoted: “it is finished” is in passive perfect tense and so is “it is written”; though most Bibles translate them as passive present tense in English. How about crucifixion, the event all Christians (Catholics inclusive) believe to be the one Christ offered Himself as sacrifice? Scripture says in Heb 9:26 that His sacrifice appeared once for all at the end of age. “Once for all” because He offered Himself as sacrifice in heavenly sanctuary, unlike Old Testament High Priest who must do it in yearly basis. It is coincidence that today is Yom Kippur, the day that High Priest will enter the Holy of Holies to atone sins of all Israelites (after Jerusalem Temple was destroyed in 70 AD, this ritual can no longer be performed). Because Christ has been slain from the foundation of the world, the Mass does not re-sacrifice Him again and again – it makes present the same Christ on the cross, which is the appearance of His being slain from the foundation of the world. The Mass is also reenactment of the last Supper mentioned in the first three synoptic Gospel – you should have no problem with this. All those three Gospels say that the Last Supper was Passover meal. The fourth Gospel, on the other hand, makes crucifixion take place on Passover eve (John 19:14), where the Jews are supposed to have Passover meal – hence it does not mention the Last Supper. Passover meal is not just simple meal to commemorate something, like Thanksgiving Day North Americans celebrate yearly. From Exodus 12 we know that Passover meal is sacrificial meal where the Jews must sacrifice and must consume Passover Lamb. The Jews of today still celebrate Passover – without sacrificial lamb since Jerusalem Temple is no longer there. According to 1 Cor 5:7 Christ is our Passover Lamb; that is the reason why Catholics believe in the sacrificial nature of the Mass – it is scripturally referred as Sacrifice of the Mass. Thank you for reading and taking the time to comment. Unlike you, the more familiar I became with the Catholic faith, along with becoming more familiar with Scripture, the more ardent I became in my rejection of it. Obviously, we are both passionate about our views so are unlikely to be persuaded against them, but let me just address one thing. If “It is finished” is in the perfect tense, then it expresses a completed action with continuing results. I don’t see how it can be interpreted to support a continued action like the sacrifice of the Mass. “it is finished” and “slain” in Rev 13:8 are both passive perfect tense and consequently have the same implication. Scripture is divinely inspired (2 Tim 3:16) then who wrote Rev 13:8 must have divine reason why he used passive perfect tense. To add my earlier reply. “It is written” is also in passive perfect tense. Whenever you buy a new copy of the Bible, does it mean the words of God is RE-written again and again, even though they are printed again and again? If you can accept this fact then you should not have problem with Catholic belief that Christ is NOT re-sacrificed again and again, even though Sacrifice of the Mass is offered again and again every day in many Catholic churches all over the world. No one would argue that every printing of every Bible is the same event as the original inspired recording. Then why you have problem that sacrifice of the mass is the same sacrifice Christ has been offering from the foundation of world, which appeared once for all two thousand years ago on the cross?